“Most people have heard of or are familiar with the Norse god Thor and his mighty hammer. Highlighted against a stormy sky, thunder crashing from his hammer, wearing a horned Viking helmet over his flowing locks, Thor is the epitome of masculine vigor and force. 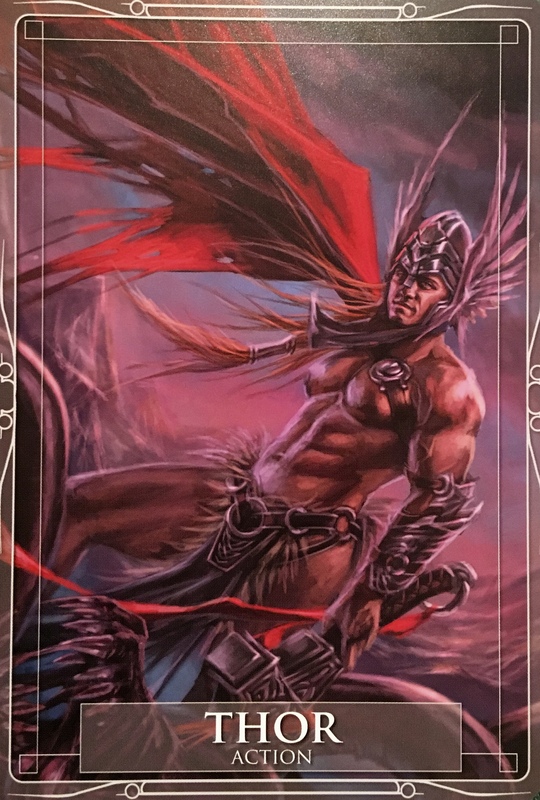 The god Thor was born of the earth goddess Jord and the supreme father god Odin, and is considered the strongest of all the Norse immortals, the Aesir. His mythology contains many stories of his exploits and his bravery, including battles with great serpents. A protector of humans, loved for his creative powers, he is nevertheless known for his hot blooded temper. Thor captains a chariot pulled by two savage, giant goats that galloped noisily across the sky, causing the sound of thunder. Thor’s hammer, Mjollnir, famous for its lethal power, became the symbol of defiance worn by those loyal to the old ways when Christianity began its spread across Scandinavia. We can call upon Thor when we need some real action. He is a brilliant rut buster, someone who will forcefully make action happen! If we feel inertia, tiredness, or frustration that things are not happening how we want, call upon Thor and his mighty hammer to smash a way through. Getting caught in a cycle of negative thought or behavior often needs forceful action, as we get comfortable with our lives, even when they are unhealthy. Thor is protective of his own, so we can feel safe knowing that his might will shield us as we move forward into the unknown. Shadow Side: “Sometimes, taking forceful action is not the most prudent path. Thor himself found this route did not always guarantee the best outcome. Coming into a sensitive situation ready for a fight – or even just a negative reaction – may end badly for all. Ask questions and be aware o when a situation needs a gentler approach and when force is actually a good instrument. Notice that this card is about strength, power and action, but it also contains a note of balance and mindfulness. Yes, we have access to the Divine Masculine principle of creative action; breaking through obstacles, out of ruts and stagnancy. It is also a breaking out of thought forms; those limiting belief systems that have been holding us back. It is not, however, brash aggression or blundering forward mindlessly. It is not storming over others to get what we want. These are old ways. The energy we are calling upon now is balanced – the warrior and the poet. This gives us access to the forces of creative action, powerful forward momentum and manifestation. It requires laser focus, steadfast intention and a good dose of imagination. Take a moment to feel into this energy, poetry in motion. And after all, who couldn’t use a little Thor in their lives!